Optogenetics is a biological technique involving the use of light to control cells in living tissue, typically neurons, that have been genetically modified to express light-sensitive ion channels. It is a method used in neuroscience research to control the activity of specific cell types in live brain tissue by exploiting engineered light-sensitive proteins, such as channelrhodopsin (CHR), halorhodopsin, and archaerhodopsin. Similar to Fast Scan Cyclic Voltammetry (FSCV), millisecond-scale temporal precision is central to optogenetics, enabling scientists to keep pace with fast information processing. 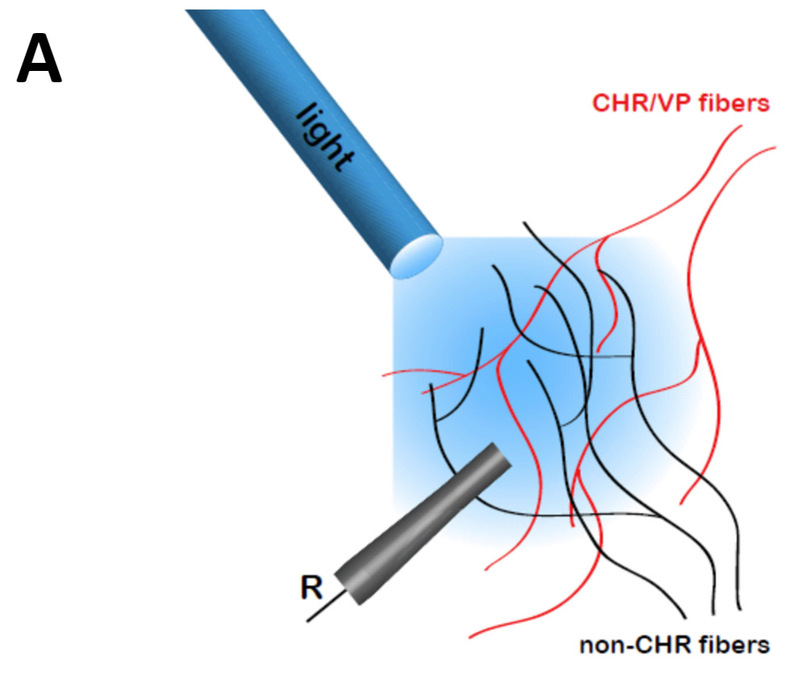 A) Optogenetic targeting of VP fibers projecting to the VTA allows selective activation. B) ChR2 expression. C) Voltammetric data collected in the VTA in response to a 5 msec light pulse (arrow). D) In vivo optogenetic manipulations are useful for correlating specific neural circuitry with behavior.